Are you looking for new and fun ways to get your partner outside? There are a lot of ways to get your partner interested in joining you outside, even if they are not the biggest fan of the outdoors. By finding new interests you both like, you and your partner are sure to be adventure buddies in no time. It can be intimidating to join your marathoner of a companion for an afternoon jog or your semi-pro golfing buddy for a day on the green. Starting from a clean slate may allow your partner to feel more comfortable when pursuing new endeavors. Trying something new allows for exploring something together and building a partnership rather than a competition. Try taking a lesson of an outdoor sport that neither of you have tried. It allows for you to both experience the elements together and gain the ability to laugh at yourselves when you make mistakes. Committing to doing a fun run, tough mudder or even a marathon allows you to hold each other accountable. It can be a small event that you work toward completing together. It can give you and your partner a way to support each other as you progress in your training and reach milestones along the way. Starting with a fun run is a great way to get outside, get your heart rate up and test to see if you like organized races or not. Tough mudders can be great for couples who have some issues to work out because mud slinging is welcomed! Another great option is entering a benefit walk or run. There are numerous studies of the health benefits of philanthropic work. Coupled with the benefits of exercise, you and your partner could be on your way to building a stable foundation for a very long life together. It can be difficult to coax your partner outside the house when the rewards of a hard workweek could be easily be in the form of ice cream and Netflix binges. 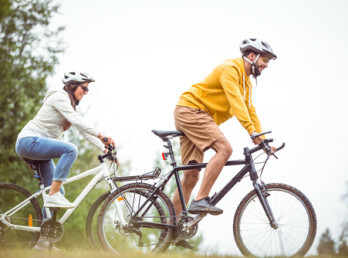 If your partner is type of person that is driven by reward upon completion, organizing a hike or biking activity that has added benefits may seem more enticing than training for a marathon. Try planning a backpacking or hiking trip that end at a hot springs or mapping out a bike ride through your town with the end destination being their favorite pizza parlor. If you are looking to create a little bit of competition, pack an airsoft gun and set up a shooting range at the summit of your next hike to see who has a better shot. Every city and town has a great place to watch the sunset from, seek that place out and pack a picnic to bring with you to enjoy after an afternoon of tennis.